Are you thinking about renting an RV for the first time, but don’t know much about them? Well you’ve come to the right place. 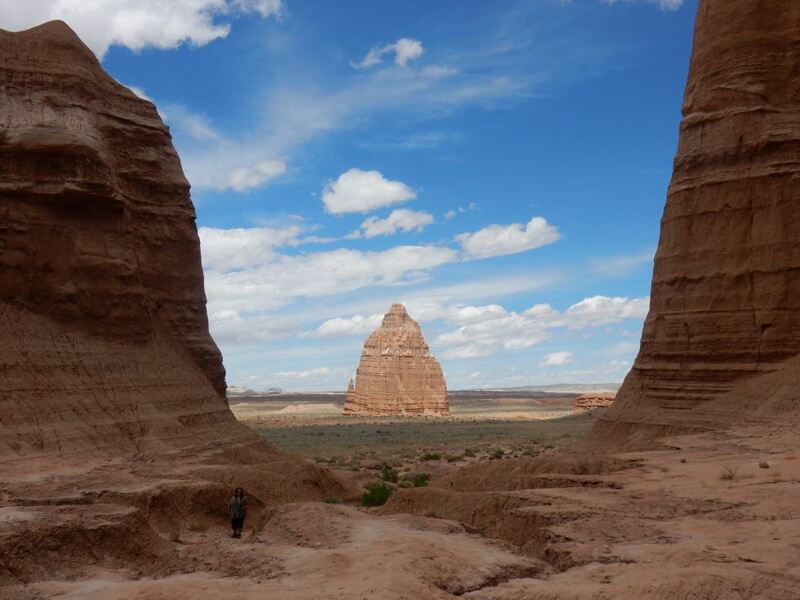 Renting an RV on Outdoorsy is easy, and operating an RV isn’t too difficult either. 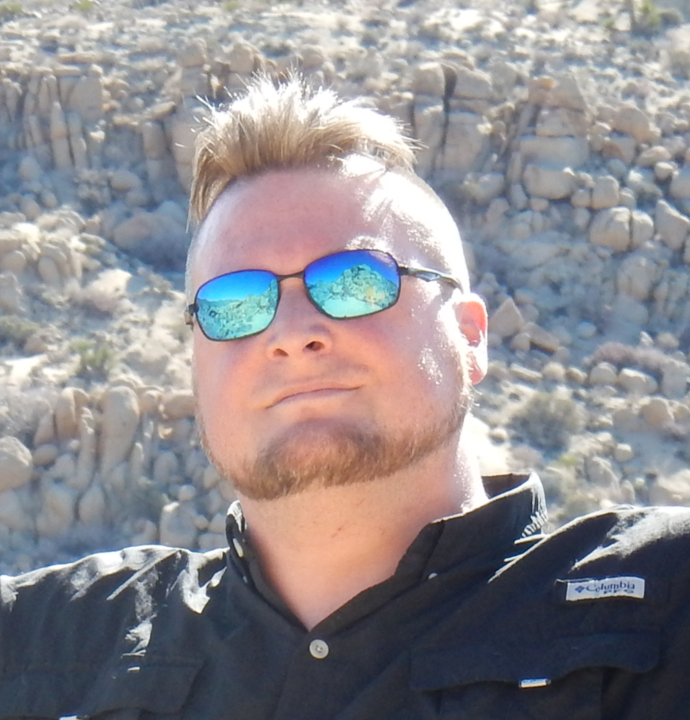 That said, there are a number of basic things you’ll need to know to have a safe and fun trip in an RV. Let’s take a look. There are many types of RVs to rent on Outdoorsy. Here are the basic categories they fall into. Trailers are RVs you hook up to another vehicle and tow. 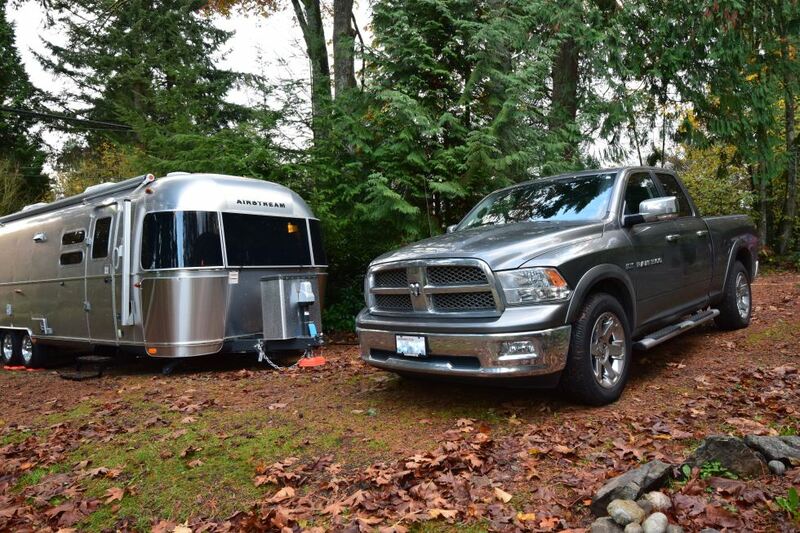 There are two common types of trailer: Travel Trailers and Fifth Wheels. Travel Trailers: These hook on to the back of your vehicle using a standard hitch. They vary in size from 12- to 30-feet in length. Fifth Wheels: These connect into a special hitch installed in the bed of a pickup truck. They tend to be much larger than travel trailers and are more stable. Motorhomes are RVs in which the RV includes its own motor and doesn’t need to be towed. These are three basic types: Class A, B, and C.
Class A: These are really big and look like a large bus. Class B: These are small motorhomes that look like vans. Class C: These are mid-sized and look like a big truck with a very large and extended camper built on the back. 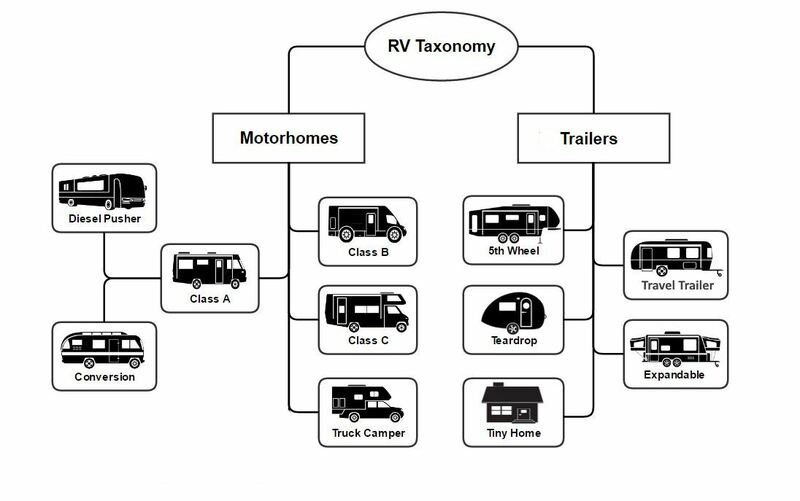 This diagram shows some of the less common types and variations on Class A motorhomes. For a newbie, a Class C is a standout choice. These feel similar to driving a large truck—bulky, but not especially hard to manage. They aren’t enormous, but they are big enough to have most of the comforts of home, bathroom included. Like other motorhomes, they’re pretty simple to set up camp and break camp. 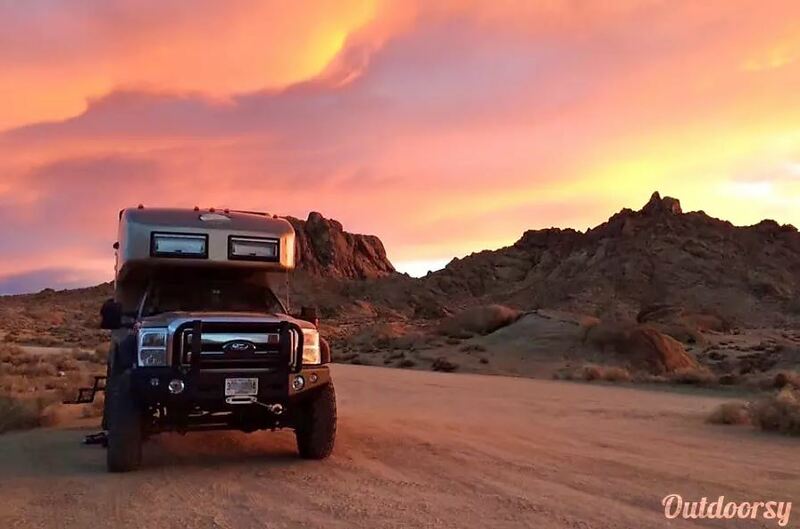 If you want to get out into the backcountry, you might consider a small travel trailer. Once you disconnect the trailer, you can use the tow vehicle to go exploring. The tricky bit is you need to make sure you have a tow vehicle and hitch that works with the trailer. Set up and tear down more complicated with trailers. If you are looking to head into urban areas, a Class B is ideal. They are still fairly big, but you can actually park one in a city, unlike most of the others where you will have some real struggles to find a place for it. A trailer can work well here too, so long as you park outside the city and drive the tow vehicle into town. For total luxury on a longer trip, Class As or Fifth Wheels are the way to go. Just be aware—driving these monsters can be nerve-wracking if you’ve never done it before. These are very big machines and they take some practice to drive. It’s a good idea to work your way up to these big rigs. When you travel, you’re most likely going to be staying at an RV park of some kind. There are a great many of them all over the country and you’re likely to find them anywhere you need them. Doing a Google search for RV parks in the area you want to visit will turn up lots of options for you. Be sure to read reviews though because park quality can vary widely. You need to know how long your RV is when making reservations. If you have a trailer, you want trailer length without the tow vehicle. Not every park can accommodate every RV. A pull-through site lets you come in one side and leave through the other. It’s nice and easy. A backup site requires you to back the RV up into the site. As a first-timer, a pull-through is easier for you. Travel trailers are especially tricky to back up with and take a fair bit of practice. Class A’s are easier than you might imagine as they generally include a backup camera. When you get to the campground, read the rules sheet they give you. Following camp rules will make your stay much nicer and make all your neighbors much happier. Overall, driving an RV is not especially difficult. The size can make it unfamiliar and nerve-wracking at first, but the manufacturers work hard to make them as easy to drive as possible. Mostly it just takes common sense, and a little bit of practice. It’s important to know how tall your RV is when driving. Class A and Fifth Wheel RVs are especially tall. News flash: There are actually tunnels and underpasses throughout the U.S. that are too low for your RV. Don’t make the tragic mistake of running into one. Better yet, get a navigation computer that has a truck or RV mode. This will help you avoid getting into a bad spot with low overhangs. You should keep to the right-hand lanes when driving on a highway or freeway. In some states it’s the law, but in all, it’s common road etiquette. In some states, if you have five or more vehicles right behind you on a single lane road, you are required to find a safe place to the side of the road and let them pass. The bigger your RV, the more you need to mind the wind. It’s not safe to drive most RVs in high winds. Strong winds can both blow you off the road or cause your RV to flip over on its side. If you have a high wind warning for your trip, delay it until the danger has passed. Don’t take chances with this. These beasts are among the biggest on the road. The main challenge is making sure you have enough space to turn and maneuver on the roadway. Try to stick to major roads when you can. Construction can also be tricky to navigate. Even mild winds can push pretty hard on a Class A. You may have to steer into the wind consistently on a straight road in a stiff wind. If you don’t feel in complete control, you should pull over until the wind dies down. Moving forward, towing a trailer is actually really easy. However, backing up a trailer is quite challenging the first few times you do it—in fact, it won’t feel intuitive at all. Take it slow and deliberate your first times, and try to have someone spot for you. We have lots of specific tips on this here. Another challenge is the danger of trailer sway. In some cases, this can cause the trailer to go one way, and the vehicle to go the other. If you don’t get it under control it can lead to a crash. The best way to stop it is to apply the manual trailer break until it stops. 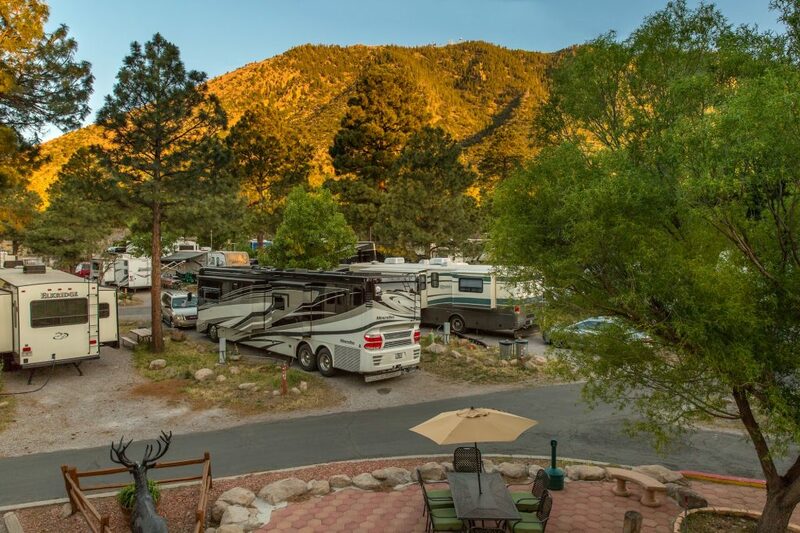 When parking at your campsite, the first thing you’ll need to do is get your RV leveled out. This is both for your comfort, and because the RV will function better when it’s level. This is especially important to do for the refrigerator. They can malfunction and cause a fire if they are used when the RV is too unleveled. Leveling blocks: Broad and sturdy blocks or pads designed for the stabilizers or jack to rest on, either for more height or because the ground is uneven or soft. Motorhomes tend to have built-in leveling systems that use hydraulics to both level and stabilize the RV. They tend to be controlled from a panel in the RV and will tell you if it’s level. More advanced models can auto level the RV for you at the push of a button. You still need to chock your wheels and set down pads/blocks before you engage it. Each one is a bit different, so you need to follow the instructions that come with it. With motorhomes, the Jacks also serve as stabilizers and the RV will have either three or four of them. A very long Class A might have more than four. Trailers will have a single front jack that is used both to enable you to hitch and un-hitch your trailer and to level it front to back. Trailers almost never come with side to side jacks. Instead, you level side to side by placing stabilizer blocks or wood planks on the low side of the trailer and driving the trailer wheels up onto them. Once in place, you then un-hitch the trailer, chock the wheels, and finally level end to end using the jack. Once a trailer is leveled, you deploy stabilizers at each corner to keep it from wiggling around. These are not for leveling the trailer and will buckle if they take the full weight of it. Some trailers will have power stabilizers but manual ones are more common. 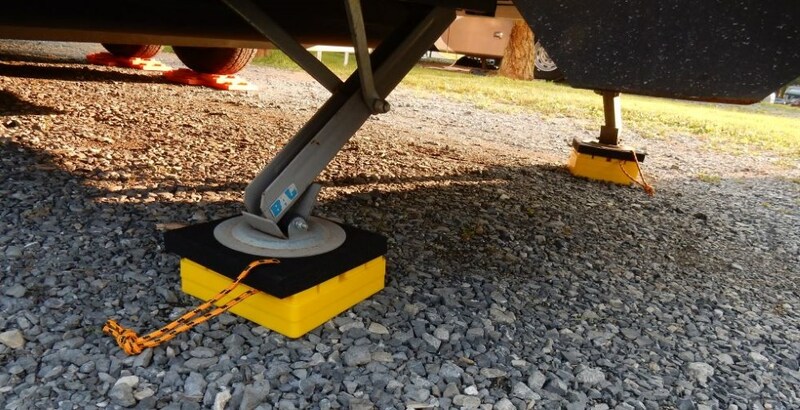 Some trailers may have auto leveling systems with jacks in all four corners that work more like those in a motorhome. Your RV gets power from two sources: batteries and shore power. Shore power is when you plug your RV into an outlet at an RV park. When it is not plugged in, everything runs off its batteries. The batteries in most RVs can only run limited appliances, and only for a fairly short period of time. Things like the microwave and air conditioning typically require shore power. Your battery gets recharged when you plug into shore power or when you have an external power source like a generator or solar panels. Motorhomes sometimes have a built-in generator. The bigger the motorhome, the more likely it has one. Trailers generally don’t, though some large Fifth Wheels do. Motorhomes can also charge the batteries while driving. With a trailer, the tow vehicle can charge the trailer batteries while the brake system is connected and the vehicle engine is running. Your RV will be rated for a certain amperage—usually 20, 30, or 50 amps. You can plug into a lower amperage, but you won’t be able to use some of your appliances without risking an overload of some kind. Try to make sure you have the recommended amperage available. You can hook to a higher amp system without worry, but you will need converter cables to step you down to what your trailer is designed for. Nearly every RV has three water tanks: Fresh water, Grey water, and Black water. Fresh water: This is the water you use to drink, cook, shower, and flush with. It is your water supply. Grey water: This is the water that goes down the sinks and from the shower. Black water: This is the water that comes from the toilet and everything else you add to it when you use the toilet. Your RV will have a meter to tell you how full each of these tanks is. RVs will also have a clean water line where you can directly plug in a hose to use the local city water supply directly. When you do this, you don’t need to use the fresh water tank. You should only put fresh clean water into the fresh tank. You should have a special hose that you only use to fill the fresh tank. You should never use it with the other tanks. For the Grey and Black tanks, you want to avoid getting any harsh chemicals in there. Drain cleaner and the like can eat away at the tanks and cause them to rupture. Basically, if you don’t know its safe to put down the drain or in the toilet of an RV, don’t put it in there. For the toilet, you need to use compostable single-ply toilet paper. It will break down in there and flush out easily. Other stuff will turn into a caked on mess inside the tank. You really don’t want that to happen. And again, any cleanser or deodorant not specifically designed for RVs should be avoided. Finally, before you make a solid deposit into the black tank, make sure to flush a gallon or so of water into it first. That keeps things from sticking to the bottom. 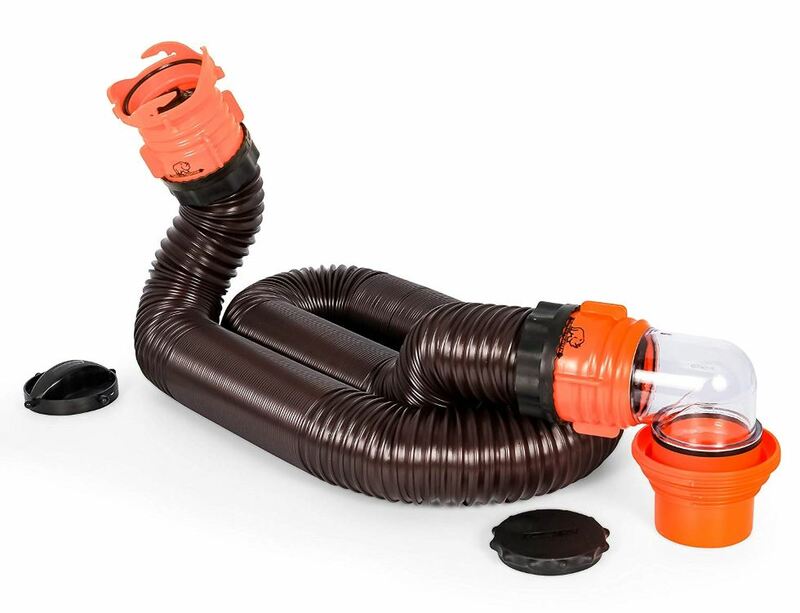 If you have sewer hookups, you connect the black tank to the sewer using a flexible pipe. You can set this up when you arrive, or you can wait until the tank is nearly full. You want to make sure the pipe is running downhill to the sewer or it won’t work. The same pipe can empty both the black and grey tanks. Typically, you would flush the black first, then the grey so that the grey water helps clean out the pipe. When dumping, you want a water source to help you flush out and clean the pipe and the tanks. Your RV will have a hose port for flushing the black tank. You want to use this only when you have the flush valve open for dumping. Otherwise, pressure builds up in the black tank and you can end up with an exploding toilet. You don’t want that, trust me on this. You can also use the water source to clean out your pipe before putting it away. If you don’t have hookups, then the RV park will usually have a dumping station for everyone to drive up and use. It’s illegal to dump your sewage anywhere else. If you are going somewhere that has no sewer, you need to be careful about filling your tank. You can also bring an external black water storage tank if you need to. If you rent a trailer, you need to make sure you know how to hitch and un-hitch it safely. The most essential point is to ensure the trailer isn’t going to move when you hitch and un-hitch it. Here are the basics for un-hitching. Here are the basics for hitching. Ready for your first grand RV adventure? Search for a great RV to rent in your area now! Previous Post « Not-To-Miss Fall Festivals In The U.S.